The Berliner-Joyce OJ was a U.S. observation aircraft built by Berliner-Joyce Aircraft. The OJ was a two-seat twin-float biplane with a fabric covered fuselage and staggered wings. The prototype designated XOJ-1 first flew in May 1931. It was designed to meet a United States Navy requirement for a lightweight observation biplane that could be used from catapults on light cruisers. After winning a the competition against Keystone an order for 18 aircraft production aircraft designated OJ-2 was placed by the Navy in March 1932. Two follow on orders were placed, one in May 1933 for nine aircraft and a further 12 aircraft in December 1933 for use by reserve units. A request for a modified version designated XOJ-3 which was to have a partially-closed canopy and other improvements was abandoned. The OJ entered service with VS-5B and VS-6B in 1933 mainly for use on Omaha class light cruisers. Some OJs were used by reserve units with the first being VN-6R which were based near Washington to train reserve pilots and to enable staff officers to maintain their flying categories. By 1936 all the remaining aircraft were operated by reserve units and at the outbreak of the Second World War 29 aircraft were still in service. 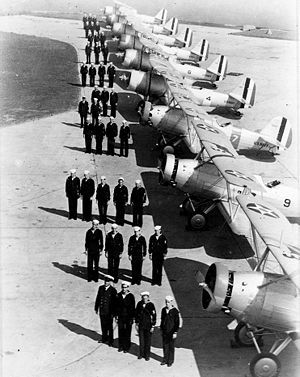 The Navy stopped the overhaul program for the aircraft and by the middle of 1941 all of them had been struck of charge. Unusually for its generation only four aircraft were lost in accidents without any loss of life. XOJ-1 Prototype powered by a 400hp R-985-1 piston engine, one built. OJ-2 Production variant which had interchangeable floats or wheeled landing gear, 39 built. XOJ-3 Proposed improved variant, not built. Listemann, Phil (Winter 2004). "Berlin-Joyce OJ". Air-Britain Aeromiltaria 30 (120): 158-163. ISSN 0262-8791. Swanborough, Gordon; Bowers, Peter M. (1976). United States Navy Aircraft since 1911. London: Putnam. ISBN 0 370 10054 9.